A few years ago, the trend of refrigerator magnets trickled into our home when a ‘Statue of Liberty’ magnet found space on the fridge surface. Over the years, several magnets from India and abroad have jostled for space on the grey surface. 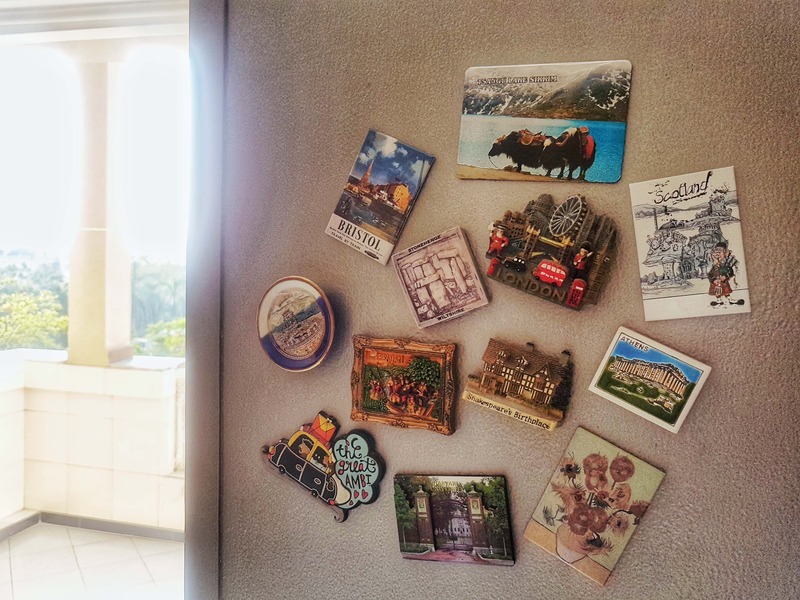 From the front of the fridge, magnets made their way to the visible side and then gradually on the steel wardrobes in our rooms. I’d always wondered about the why of gifting someone a fridge accessory – answers ranged from “it’s the cheapest gift” to “its accessible” or “it shows they thought about us”, depending on the individual. But somewhere it played at the back of my mind even as I saw myself picking out magnets for friends and family during trips. Up until a few days… when sunlight crept into my room through an open window and forced me awake at 5am. I lay snuggled in my light blanket, enjoying the nip in the fresh air and indulging in a glorious, jaw-cracking and neck-straining stretch, when my gaze landed on the magnets stuck on my wardrobe. These are among the souvenirs I’ve picked for myself in the last few years. And as my drowsy eyes lingered over these colourful pieces, it struck me that each decorative magnet has a memory attached – it tells a story of the moments in which the magnet was bought. The conversation struck with the shopkeeper, the little bits of trivia shared by the businessman, the intense concentration whilst choosing the perfect magnets and deciding on the spot ‘who gets which’… there is much that has gone into choosing these little bits of memory. It’s okay to start off the ‘Magnet Stories’, right? After all, what better way to share snippets of a trip than with the object that revives those memories? Take for instance the latest magnet additions from Azerbaijan where the elder sister and I did not do a speck of shopping until I chanced upon a tiny corner in the duty free! It so happened that we were being hosted by the elder’s friend and family who ensured that someone was with us at all times. Helping us navigate the language hurdle in the villages beyond the capital city of Baku, Nurinj and her elder sister Seva were a constant source of information and support through the trip, guiding the Bhaumick sisters through food, traditions and interacting with locals. In the eternal quest to see as much as we could, however, we completely missed out on buying some knickknacks and souvenirs to carry home for ourselves and the parents! A tad bit disheartened, I was strolling through the compact but beautiful international departure lounge when my eyes landed on the magical words ‘magnet’. Delighted, I rushed ahead and almost toppled over the tiny display stood on the cashier’s desk, eager to grab the pieces. “Can you give me some options,” I urged the storekeeper whilst inspecting the magnets with microscopic vision, fighting the guilt of not having bought some local-made. “Because you’ve come after the end of the 2018 Azerbaijan Grand Prix that is conducted in the Baku City Circuit and draws a massive number of racing enthusiasts to the Land of Flames. So basically, we are out of stock!” he said, already ringing up a bill for the three magnets and trying to gently push me out of the store as I lumbered around with my dainty backpack, determined to look for more budget friendly souvenirs. But yours truly refused to budge and got around to quizzing the storekeeper about the treasures in his store, determined to add some more numbers to the credit card. And I struck gold! No … not with the material kind but the human kind! Because the very kind store keeper did a complete volte-face and was soon sharing his knowledge about local music pouring over the magnet I’d bought from his store. A rectangular, hand-painted scene of a group of Azeri folk musicians gathered over an Azeri carpet in an open green space. Each in the group of three is playing a different instrument – while one has hand raised to beat the dayereh (a medium sized framed drum), a second is strumming the tar (a long neck one-string instrument) and the third is playing the oud (a several-stringed instrument). A few feet away, there seem to be two female figures looking on as the folk musicians strum their tunes. Variations of the scene etched on the magnet have been found in books and paintings since ancient times, said the storekeeper. “There are more big ones of the scenery” – like the one of Baku’s cityscape that my mother likes – “which are more popular. It is not often that people take such artistic magnets. And even if they do, no one bothers to ask us what/if the etching is of significance,” said the storekeeper, who even asked why we failed to buy mementos at the Palace of Shirvanshahs! A call from the elder who was waiting to clear the security broke up our conversation but as I bid my adieus to the storekeeper, I couldn’t help but wonder at the truth in his statement. Did or did I not help a hardworking local when I bought those magnets?